Signing into Facebook this morning, I was given the option of trying out the new layout. 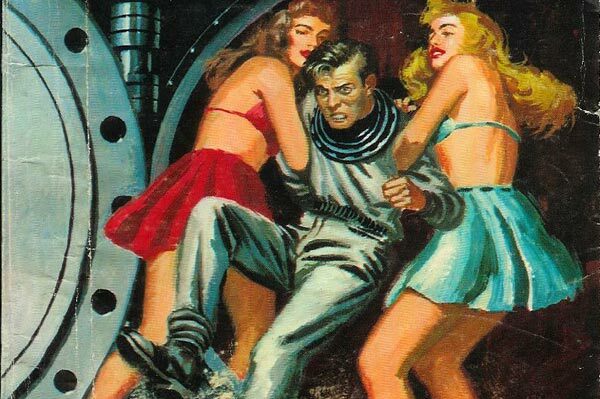 Now, generally, I am not a Facebook early adopter. 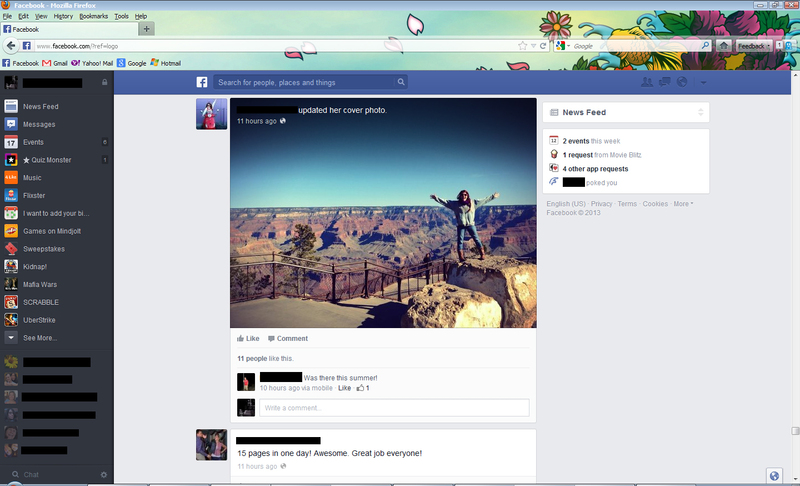 Typically I’m a Facebook last-man-standing adopter, being dragged kicking and screaming into their new layouts. This time I decided to just bite the bullet and hop on the early train to Newtown-on-Facebooksville. 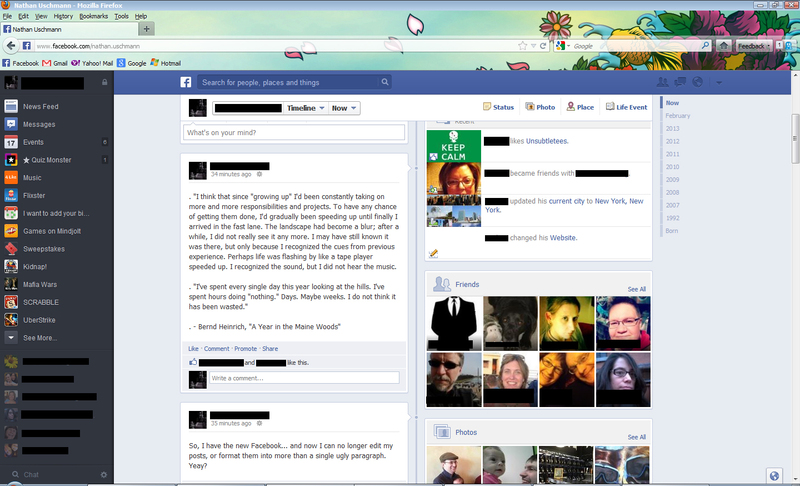 So here are my early, just getting into the meat of the newness, thoughts on the new Facebook layout. Simple, clean, with navigation bars on the left and right that easily point to areas you may use. That said, it also pops up a lot of things that I don’t use at all… “Mafia Wars”? I don’t think I’ve signed on to any Facebook game in years, especially that game which I only played briefly. But now Mafia Wars is one of my most accessible links. Hrm. Annoying, but not the end of the world. Perhaps I can edit that navigation bar? I haven’t figured out how yet, but it may be possible. Maybe not. One thing I’ve noticed though is that formatting posts is a little more annoying. To indent a paragraph… well, you simply can’t. Not without cheating, at least. And to start a second paragraph, hitting enter once apparently doesn’t register in the formatting at all. So a well laid out, indented, multi-paragraph post that you write ends up looking like a single, hideous, paragraph. As you can see in the image above, there is a workaround. To indent, type a period, and then space once (more than once doesn’t register), and then start typing. It’s still ugly, and pointless, but I did it just to show that it’s the only way it can be done. As far as starting a second paragraph, it does appear that hitting enter twice works, so there’s that. It’s a little annoying that Facebook doesn’t accept the formatting as you enter it, but it’s not the end of the world. And who knows, maybe they’ll fix it later on. Finally, I’ve noticed that the ability to edit my posts has been removed. Now, I’ve asked around, and it appears that I was the only person in all of Facebook that was able to edit their posts without deleting them. But I used to be able to edit right after I posted. No longer. Maybe they’ll add that back in? Maybe I should never have had that ability in the first place? I’ll miss it though, it was handy for someone like me who doesn’t edit before posting, only after. In the end, despite those minor complaints on posting status updates, it’s really not bad at all. I like the new layout, it’s easier on the eyes. There’s really not anything new, no new features yet that I can tell, though Graph Search is on its way apparently. It’s just a slightly new look. I’m sure I’ll find more annoying things down the line, but for now I like it. And it’s nice that a Facebook update for once isn’t the most annoying thing ever, like they typically tend to be.